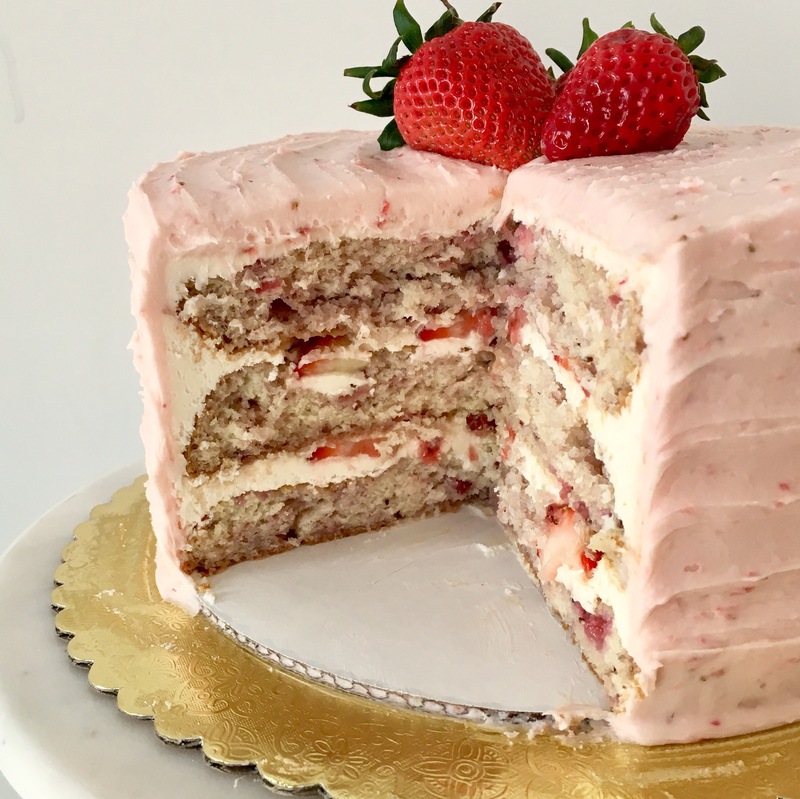 Nothing says spring quite like fresh strawberries and I was craving them in cake form. I looked around for Strawberry Cake recipes and was kinda disappointed that all I could really find were recipes that used Strawberry Jello. Not what I had in mind. I wanted a cake that tasted fresh and light, so I decided to come up with my own. I don’t generally think of myself as a recipe developer, but on some level, I suppose I am. Through a lot of trial and error, I’ve gotten a feel for how things will translate into a gluten free recipe, the kind of texture I’ll end up with and how the flavors will interact with each other. Here’s a little insight to my reasoning when coming up with this recipe that might help when you’re converting your own to gluten free. I REALLY liked the way this Strawberries and Cream Cake turned out and I hope you will all love it too! 1 – I knew that I wanted to use fresh strawberries, but the flavor has a hard time translating when baked, so I decided to make a strawberry sauce on my stovetop and strained the extra liquid, leaving the reduced strawberries to add flavor to the cake itself. 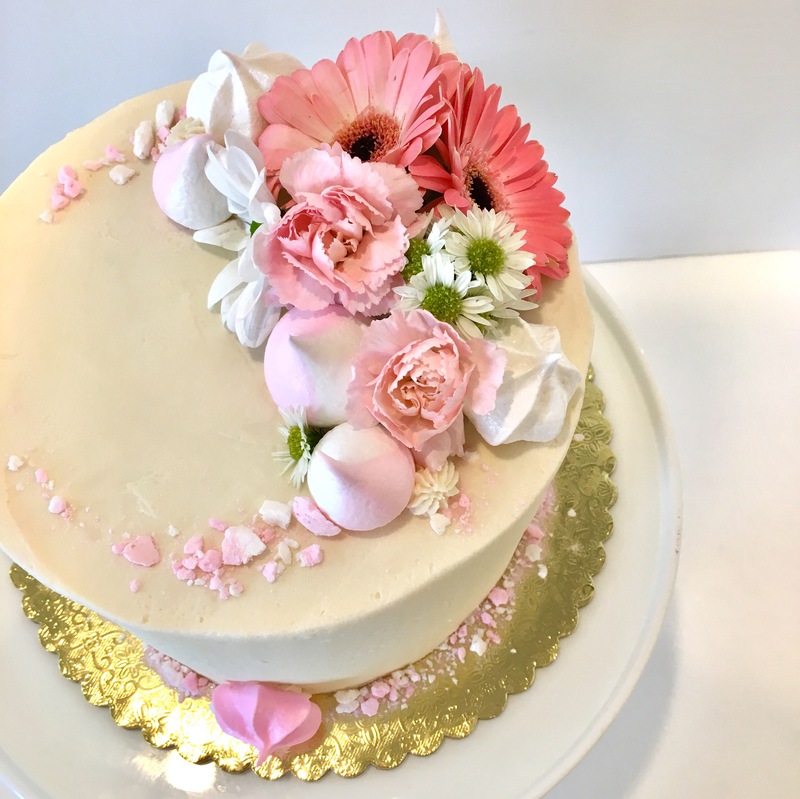 You can add some pink or red food coloring, if you like the look of a pink strawberry cake, but I wanted mine au naturale. To make the sauce, simply rough chop about 2 cups of fresh strawberries and put them in a sauce pan with 1/2 tsp. lemon juice, 1/2 cup sugar and about 1/4 cup water. Heat on medium to boiling and reduce the heat, but allow to simmer for several minutes to cook off some of the liquid and create a syrup. Allow to cool either on the stovetop or in the fridge and strain the extra juices. 2- I also knew that I wanted something light and spongey, so I planned straight off to whip up a few egg whites and fold them in at the end. I knew this would add an airiness to the cake that would make it feel and taste light. In a bowl separate from your cake batter, add three room temperature egg whites and whip with beaters on a hand help mixer or the whip attachment on your stand mixer on high for several minutes until they form stiff peaks. As always with egg whites, make sure that your bowl is clean and that no water or egg yolk contaminate the whites, or they won’t whip up. You’re going to gently fold these in at the end with a rubber spatula to give your batter some fluff. 3- Gluten free flours can be very dry and brittle, so my go to trick to combat that is buttermilk. This recipe got a cup. I was worried the buttermilk would weigh down the egg whites, but they worked beautifully together. Mix it all up and if you don’t go through it very quickly, put it in an airtight container and stick it in the freezer to keep it fresh. 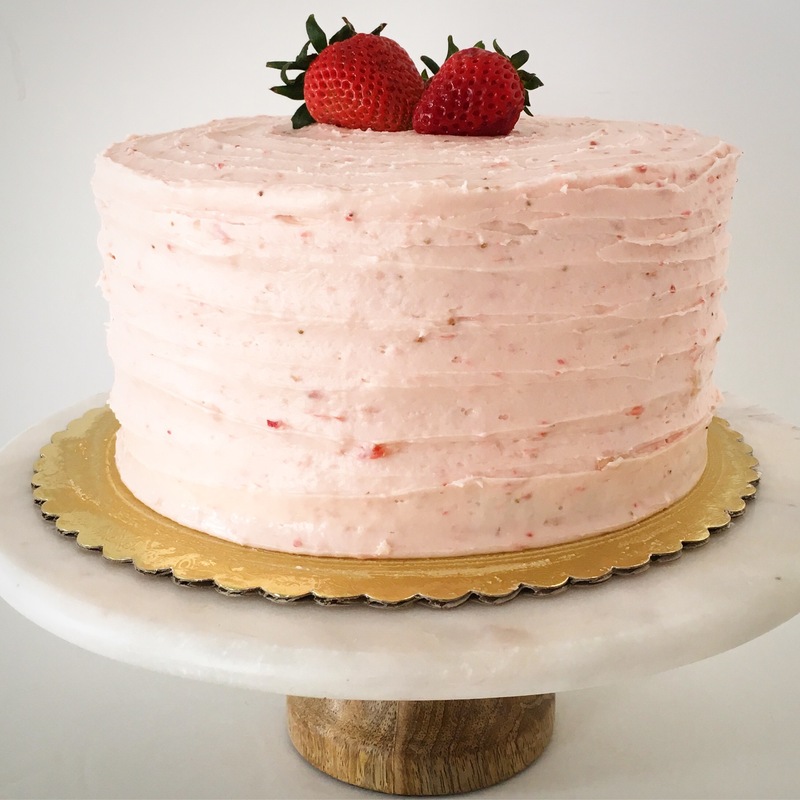 I’m also including my recipe for fresh strawberry buttercream. 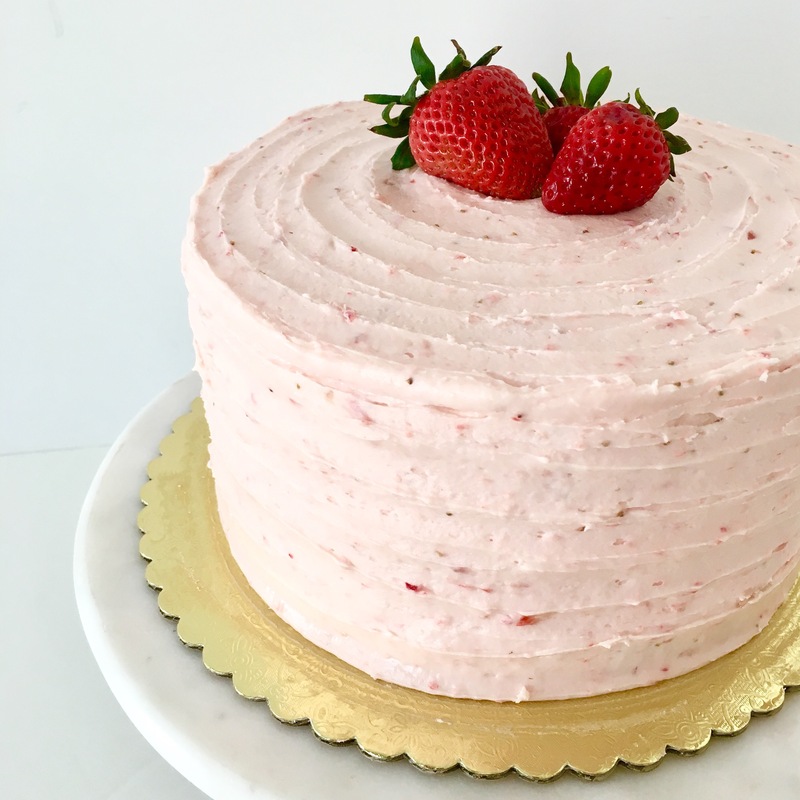 I used a whipped vanilla buttercream and more sliced, fresh strawberries to fill the cake, but next time I’d probably just stick with the Strawberry Buttercream. Keep in mind that since you are using so many fresh berries, this cake needs to be refrigerated and will have a little shorter shelf life than usual. But that probably won’t be a problem. I really hope you love this recipe, its s new favorite in this house! Preheat oven to 350 degrees and prepare either two 8″ round cake pans or one 9×12″ pyrex by spraying lightly with cooking spray and coating with gluten free flour. Set aside. Start with your strawberry sauce on the stovetop and allow to cool as you prepare the other ingredients. Add all sauce ingredients to a pan on the stove and bring to a boil over medium heat. Reduce heat and allow to simmer 10-15 minutes, stirring frequently and watching closely so it doesn’t burn. When about half the liquid has cooked off, remove from heat and allow to cool. You will add this to your cake batter at the very end. Put the flour blend, xanthan gum, 1 1/2 cup sugar, salt, baking soda and baking powder in a large mixing bowl and using your paddle attachment, turn on low until all the dry ingredients are mixed well. In a separate bowl, add 2 whole eggs, buttermilk, cooking oil, vanilla extract and coconut extract and mix well. In a third bowl, whip your 3 egg whites with whisk attachment until the whites are foamy and form stiff peaks, set aside. Add the liquid contents of your second bowl to the dry ingredients. Mix on low and scrape the sides of the bowl a couple times to ensure everything is evenly mixed, then turn the mixer up to high for 10-20 seconds to beat it well. Using a rubber spatula, slowly and gently pour the egg whites into the batter and start to fold the egg whites it. This can take a couple of minutes to make sure that the egg whites are well incorporated. Start by scraping the sides of the bowl, down to the bottom and pulling up, folding the batter into the egg whites. Gently add the strawberry sauce to the cake batter, swirling it with the rubber spatula to give it a natural look. Bake at 350 for about 25-30 minutes, keeping an eye on cake since all ovens are a little different. Cake is done with a toothpick (or sharp knife) is inserted and comes out clean. 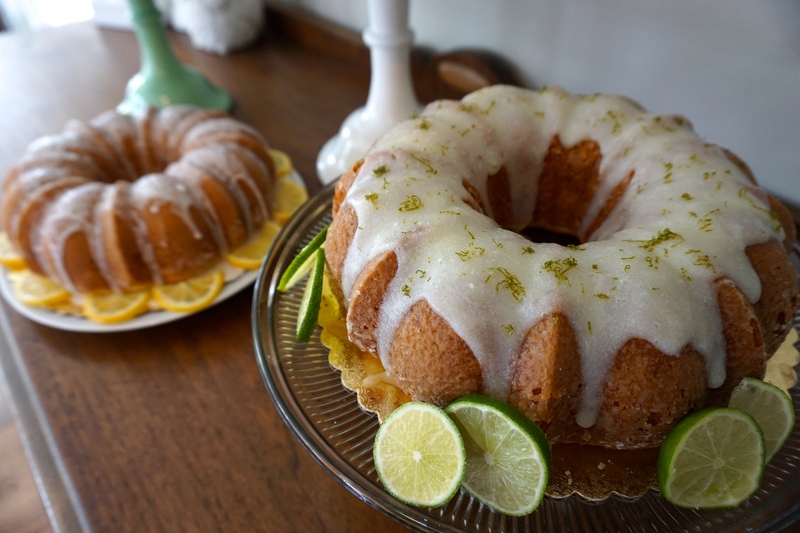 frost your chilled cake and put back in the fridge until you are ready to serve! If I had to pick a favorite treat, meringue would definitely give cake a run for its money. I think it is definitely the world’s most delightful treat. It’s extremely light, crisp on the outside, chewy in the middle and literally melts in your mouth! I love to see someone’s surprised reaction when they try for the first time and I have yet to meet anyone who doesn’t LOVE it! Every time I make meringue, someone asks me how I do it because they know it’s so hard to make, but that just isn’t true! 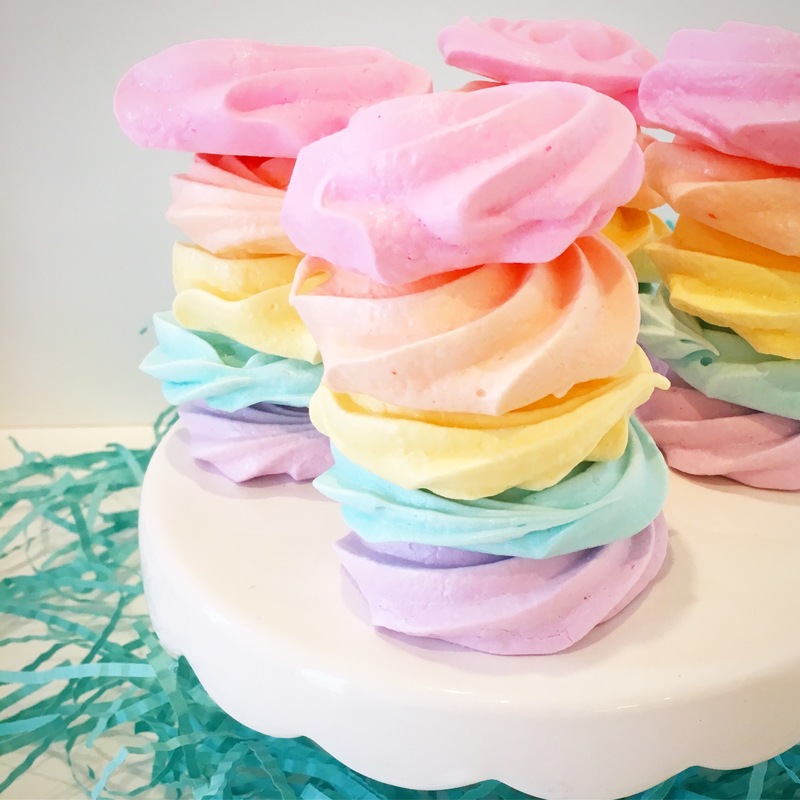 Meringue IS a long process, but not a difficult one and it can be made days and even a week in advance, so you can prepare ahead of time if you’re making it for an event. Meringue is made of only four ingredients… egg whites, cream of tartar, sugar and extract. Super simple and stuff most of is have on hand. The trick to making meringue is to respect your egg whites. They can be temperamental, but with just a couple of tips, you’ll be just fine. First thing is that your egg whites need to be room temperature. Pull your eggs out of the fridge a couple hours before you start or even the night before. If you need to bring them up to temperature more quickly, you can soak them in warm water for a few minutes but make sure that they are completely dry before you separate your whites because even a drop of water in your egg whites will prevent them from whipping up. No water. No yolk. No nothing in that bowl other than egg whites. I like to separate my eggs in a bowl and pour the white into my mixing bowl one at a time. That way, if you’re on egg 8 and your yolk cracks and spills into your bowl, you don’t have to start all over. You’ll use your whip attachment on the mixer and whip the whites for a minute or so until they start to foam. At this point, add your cream of tartar to help stabilize the whites while they whip. Keep going for a few minutes until they reach a ‘soft peak’ which is pretty much exactly how it sounds. Still foamy, but not super stiff and not dry. At this point, you’ll start add your sugar to the bowl very slowly. It can take 5-10 minutes to incorporate the sugar. If you don’t mix it long enough, the sugar will. Let and pool in the oven and burn on the bottom of your baking sheet, which isn’t pretty. You can tell when your done because your meringue will be very stiff and glossy. This is when you add your vanilla or other extract and any food coloring. Just beat the extract in and scrape the side to make sure it’s all incorporated. Spread or pipe the meringue into a cookie sheet lined with parchment paper. Get creative, the meringue will do exactly what you tell it to, so make little kisses or large pavlova. Bake at a very low setting, I like 185 degrees, but you can go up to 200 if your oven won’t go that low. Bake them low and slow and almost dry out the meringue more than bake… at least an hour or hour and half for larger meringues. When the baking is done, DON’T open the oven. You want to keep the cold air away from your fragile egg whites, so just turn off your oven let them sit until it cools. For this reason, I love making these at night and just going to bed. And there you go. Yes, it takes a while, but no, it isn’t hard. Give it a try and let me know how it goes! And check out my segment on Fox 13 The Place here for the tutorial! I’ve noticed that the first thing people start missing when they start on a gluten free diet is donuts! I totally get it. I mean, donuts. We’ve tried some store bought in our house and while they kinda have the same flavor, the texture just isn’t there. I started playing with this recipe a while ago and I’ve finally tweaked it enough that I’m super pleased with the outcome at this point and I was so happy to be able to share it on Fox 13 The Place yesterday. If you missed the segment, click here to watch! This recipe is super easy and uses a batter instead of a dough. 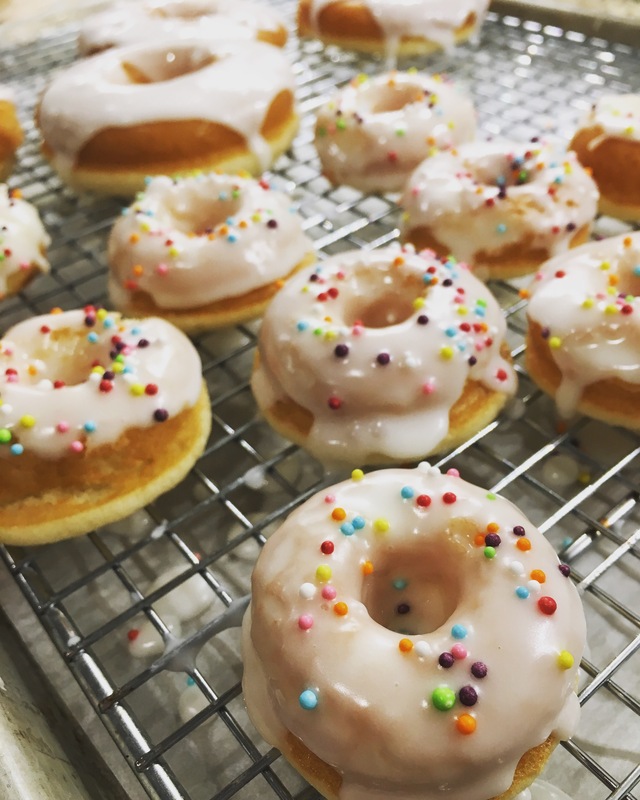 Good things about batter donuts are that you don’t need to use yeast and let them rise and you don’t have to fry them in oil, which practically makes them healthy, right? The drawback is that you’ll need a donut pan or one of those cute donut makers. The pans are pretty easy to find and relatively inexpensive. Check out your local Walmart or Target, or if you’re an Amazon junkie (like me) THIS ONE looks great. You can also make regular sized donuts with this batter, it just depends on the size of pan you have. We did it with both and had good results with both sizes, just add another minute to the cook time with the larger donuts. This is the basic recipe, but it lends itself to a lot of flexibility. For instance, it calls for a cup of milk, but you can try it with any kind of milk you’d like… almond, coconut, buttermilk. I tried it with buttermilk as well and I LOVED it. It gave them a very airy texture and they almost tasted like a dessert waffle more than a donut. 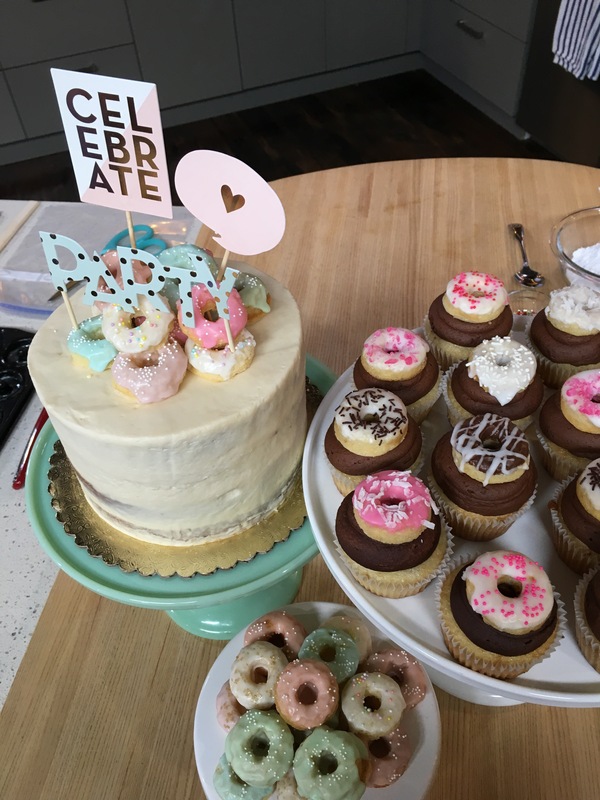 The only problem was that they were so soft, it was hard to decorate with heavy glaze and sprinkles, but if you’re just going with a light glaze and an amazing treat, give it a try! I use my own gf flour blend for everything, but it should be easy to use at whatever blend you keep on hand. You can also try swapping out about a quarter cup of your gluten free flour blend for something with more substance like flax seed meal or brown rice flour. I made a version with half white sugar and half brown sugar to give it a little more depth of flavor and it was tasty too. Play around with it and let me know how it works for you! Now for a good tip with the recipe… yesterday on the show, I made a full batch of this batter, but only made 12 mini donuts. The rest of the batter sat in the trunk of my car for several hours. At dinner, we decided to bake up the rest of the batter (as a reference, its literally, like 20 degrees here, so the outdoors provided plenty of refrigeration). When we baked them up, they were SO MUCH BETTER. I’ve noticed this a lot with gluten free batters. In fact, a lot of the time, I’ll make my cake batter and let it sit for up to an hour before I bake it. I find that it holds together much better and the cupcakes dome higher. Not sure exactly what’s at play there, but it seems to have worked with the donut batter as well. The aged batter made them softer and fluffier, more like a Krispy Kreme glazed donut! Ok, so here’s the recipe. Have fun with it and get creative with how you decorate them or decorate WITH them I hope it works as well for you as it has for me! -If possible, put batter in the fridge and allow to rest and chill for half an hour or more. -Line a cookie sheet with parchment paper and rest a cooling rack on top. Pop your donuts out of your pan and onto the cooling rack to glaze. -Just be careful not to add too much milk at first. A little goes a long way. You can make it as thick or thin as you’d like. Have fun and get creative with your colors at toppings! I had such a fun time this morning on Fox 13 The Place, showing you how to make one of my seasonal favorites, Pumpkin Eggnog Cupcakes! They are seriously so good, my friends. The perfect blend of flavors and seasons and textures all come together to make one, perfect cupcake. I really hope you give these ones a try. And don’t forget the amazing Cream Cheese Eggnog Buttercream for the top! This is such a consistent, reliable gluten free recipe that it works well in any form. On the show, I made a bundt cake with chocolate chips and a layer cake with maple frosting and candied pecans (and maple caramel sauce!) and they all work great! 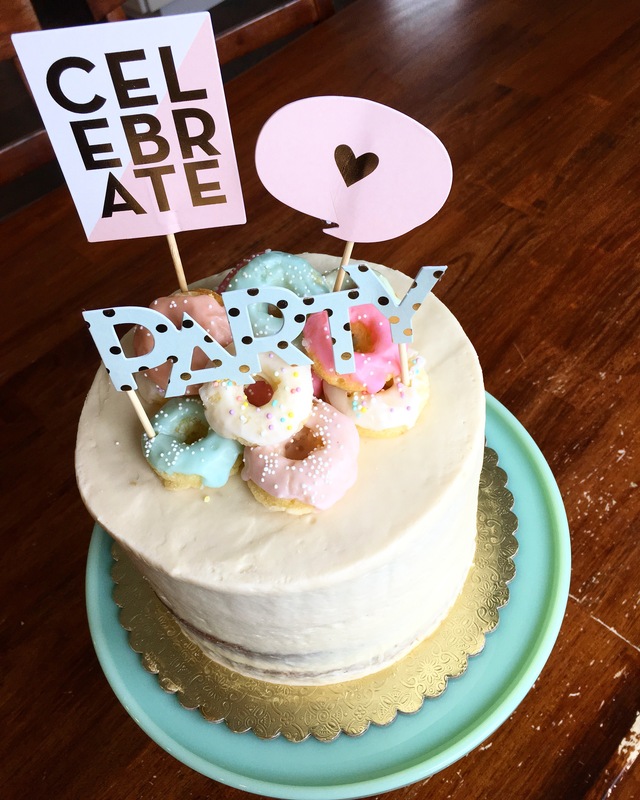 I love using a good base and tweaking it enough to get your family’s favorite treat out of it! I gotta admit, I’m a total sucker for a good sugar cookie. I’m a sugar cookie girl. They are about the best treat ever. They are also (in my opinion) the hardest gluten free treat there is to make. Maybe I’m wrong. Maybe everyone else out there has figured out some magic way to make a delicious, soft gluten free sugar cookie and I’m the only one that doesn’t know about it. If that’s the case, I wish someone would tell me. The problem is that other types of cookies can rely on secondary ingredients to change the flavor and the texture to be more like a regular ones (peanut butter, chocolate chips, oatmeal etc. ), but with sugar cookies, you’ve got nothing but flour… and a lot of it. Here in Utah, we’ve got the Swig and all the other drive-thru soda/sugar cookie shops. Apparently it’s a Utah thing, although I really don’t understand why the whole world hasn’t figured out that the best way to get your mid-afternoon caffeine and sugar fix is through the drive-thru. Probably because Utah has an unusually high population of young, tired moms that don’t want to unload their minivan full of toddlers just to get a Diet Coke. Anyway, the Swig seems to have brought the sugar cookie back into style, they are thick, they are soft, they are rich, they are pink and they are just so good. My husband’s never had one (poor man) because, of course, he eats gluten free. Lucky for us, I don’t, so this works out perfectly. I love sugar cookies, I eat sugar cookies, I enjoy me a Swig sugar cookie, I bake gluten free, I bake gluten free Swig cookies… and now I share. Let me warn you that this is kind of a time consuming process. It isn’t a hard process, but, like most sugar cookie recipes, there’s a lot of chilling involved. Take your dry ingredients and toss them in a bowl together, mix them well and set aside. Once wet ingredients are all mixed well, add the dry ones. No special way or anything, just don’t throw 4 1/2 cups of flour in your mixer and turn it on high. I speak from experience. Mix it well and scrape the bowl to make sure you’ve got it all worked in. Your dough won’t be stiff like cookie dough usually is. It will be pretty sticky, almost gummy, but it’ll taste good. You can try to bake right away, but I prefer to stick my dough in the fridge for a few hours. The cookies will hold their shape better and the dough is easier to work with. When you are ready to bake, preheat to 350 and LINE YOUR COOKIE SHEETS WITH PARCHMENT PAPER. I’m dead serious. Bake for 8-9 minutes. When you pull them out, they won’t look done in the middle. Pull them out anyway. Allow to partially cool on cookie sheet and transfer to a cooling rack to finish. CHILL THE COOKIES IN THE FRIDGE. I know, you want to eat your cookie now, and you can, but the texture will be more crumbly, not thick and soft like a Swig cookie. I stack them, put them in a tupperware with a lid, and give them a few hours. Once cool, frost to serve with the frosting recipe listed and enjoy! I hope this recipe works as well for you as it does for me. My family loves these. The kids just hound me, harass me, hover over me until I start handing them out. They be good. A big thank you to everyone who came to buy Mother’s Day cupcakes and bundt cakes yesterday. I sold all but 4 cupcakes, and my family was pretty happy to have those left over for a snack this afternoon. We loved the Hot Fudge Sundae cakes so much that I they are going on the permanent menu! If people are interested, I’d love to do this again next month for Father’s Day, with some boy flavors. My husband really wants Salted Caramel and Toffee and Maple Candied Bacon. And while you’re enjoying them, did you know that all of my cakes are made completely from scratch? Completely. Many bakers (and most recipes you find online) will start with a box mix that you can add to. Many bakeries will even start with a premade mix that they will doctor up and sell as gourmet cake, but I don’t mess with those. I think that’s one of the reasons people like my cake so much… a lot of people don’t even know what good cake should taste like! No matter what you do to a box to make it better, it’s still going to end up tasting like Duncan Hines. I even mix my own blend of gluten free flours instead of buying a mix from a store. Store bought gluten free flour blends often have a variety of flours (including bean flours) that either have a strong, distinct flavor or are grainy as soon as they cool or both. So I mix my flours, a batch at a time to make sure that the texture is as good as gluten free can get. Mother’s Day is it THIS SUNDAY! So in honor of all our moms, I’ve got a special going this weekend. 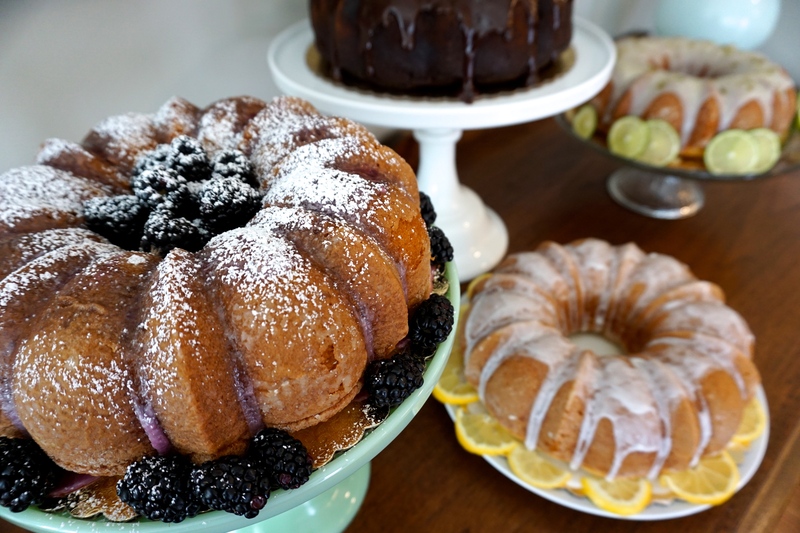 These are 10″ cakes that can feed the whole party, up to 20 people! And the non-gluten free eaters will love it too! 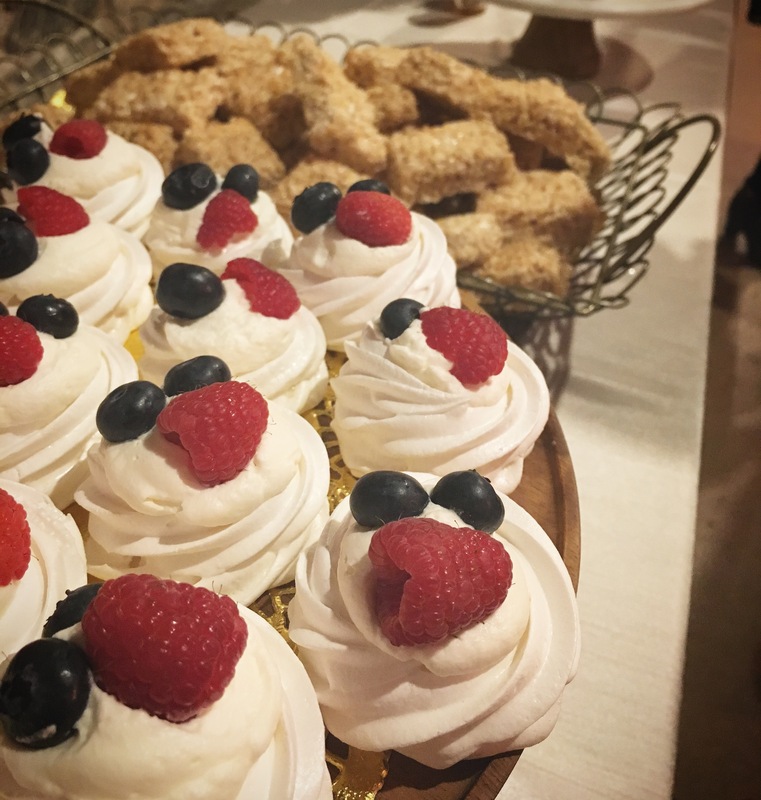 I just served these cakes at a big family party where only 4 people actually had celiac disease, but more than 30 of us gobbled them up! Usually $30, so they’re at a great price this weekend. Also, I’m going to be doing tasting boxes of gourmet cupcakes. 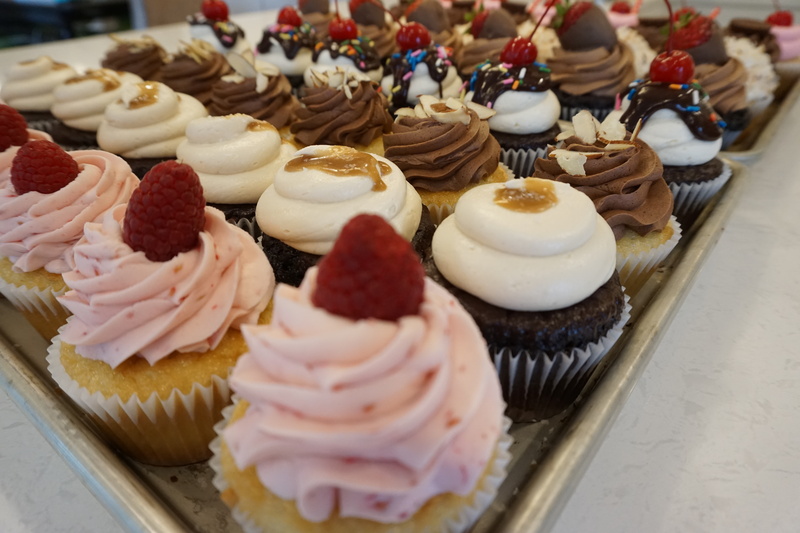 Usually, I require that you order a minimum of 12 cupcakes in each flavor when they are made to order, so this will be a chance for you to get a taste of everything! I’ll be making at least 8 different flavors, some chocolatey, some fruity, some vanilla-y. I’m almost positive that there will be Nutella and Salt Caramel involved. All cakes will be boxed up professionally and ready to gift! I can put together a box for you, or you can come pick from the flavors yourself. Everything will be ready for pick up Saturday. Message or text me to reserve yours!